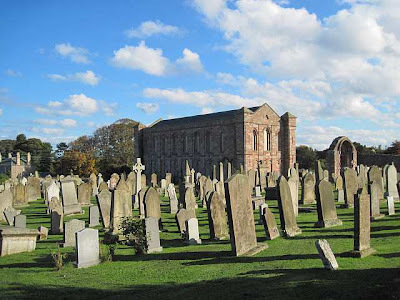 Our latest volume of Monumental Inscriptions, for the parish of Coldingham, Berwickshire is now available. 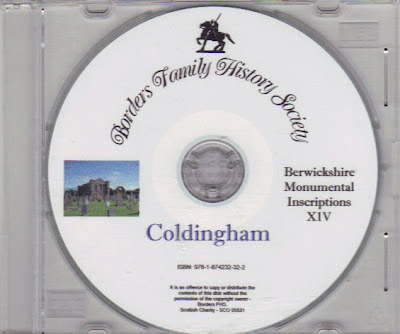 Much of the recording, carried out by members of Borders Family History Society and the Friends of Coldingham Priory, took place in 2010 when we managed to get a few lovely summer days. 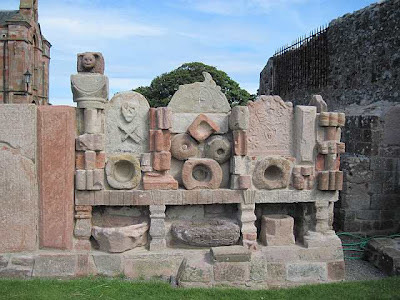 The Priory has a rich and colourful history being one of the many hidden gems of the Borders. It has been a site of worship since 1100. The first church was destroyed in 1216 and rebuilt as a much larger cross-shaped church. The north and east walls of the choir are still forming part of the present day church. Monastic remains of the cloisters and south transept can be seen outside. The priory estates of 'Coldinghamshire' stretched from the boundaries of East Lothian to Berwick on Tweed and into the Merse at Swinton. Coldingham, a popular holiday destination for many, has a new Luckenbooth post office and visitor centre, which opened in November 2011. Over the next couple of months, the Luckenbooth will become home to a permanent exhibition of artefacts, photographs and information on the parish, Priory and village with displays on touch screen terminals. Contributions of photographs and reminiscences will be welcomed and added to the information on the terminals so that the resources for the parish and village will continue to grow and improve. The Priory is usually open to visitors on Wednesday afternoons (2.00pm - 4.00pm) and on Sundays in July and August at the same times. There are over 600 surnames (and their variants) on the memorials with the surnames Wilson, Nisbet, Aitchison, Purves, Hood, Thorburn, Johnston, Gray, Robertson, Cowe, Wood, Paterson, Patterson, Scott, Craig, Allan, Bell, Chisholm, Cockburn, Smith, Henderson, Rae being the most recorded. In this volume of the Monumental Inscriptions, we have included a more detailed index which lists the Surname, Other Surname, First Names and Date of Death wherever these are available. Many of the stones are of local stone and have become very worn and illegible and like so many of our cemeteries, the weather can cause considerable damage. Details are not available for several stones which have fallen and in this year's winter gales, another two memorials, an 1886 obelisk and a large 1881 stone, have both been badly broken. Included in the Coldingham MI volume is the 1694 hearth tax, the 1801 militia lists with the militia families vouchers of 1809, 1812 and 1813. Over 1090 memorials are listed, including the war memorials and rolls of honour from St Abbs and the Priory. The surnames included in the gravestone inscriptions are: Aernaldus, Affleck, Aikman, Aire, Aitcheson, Aitchison, Aitken, Aldred, Alenshaw, Alexander, Allan, Allanshaw, Allenshaw, Allison, Anderson, Armstrong, Atkin, Auld, Baillie, Baird, Barber, Barclay, Barnes, Barrie, Baynes, Beattie, Bell, Bennett, Bentall, Bertram, Binnie, Birne, Bishop, Bissett, Blaabjerg, Black, Blackhall, Blackie, Blair, Blues, Bogue, Bolan, Bolton, Bonner, Bookless, Borthwick, Boyes, Brack, Braidford, Bremner, Broadhurst, Brodie, Broun, Brown, Bruce, Brydone, Budge, Buglas, Buglass, Bullen, Burgon, Burns, Cairnie, Cairns, Calder, Cameron, Campbell, Cant, Capstick, Carfrae, Carr, Carruthers, Carson, Caverhill, Cessford, Chambers, Chapman, Cheverton, Chirnside, Chisholm, Chisomme, Chrystal, Clark, Clazie, Cleghorn, Clement, Clerk, Clinkscale, Close, Coates, Cockburn, Collin, Collins, Colven, Comb, Common, Connel, Connor, Cook, Cookson, Cooper, Cormack, Cossar, Coulson, Couser, Cow, Cowan, Cowe, Cowling, Craig, Craik, Craise, Craw, Creck, Crombie, Crooks, Crosbie, Crow, Crowe, Cullen, Cunningham, Currie, Curry, Dalgliesh, Damborg, Darge, Darling, Darrie, Davidson, Davidson, Davie, Dean, Deans, Denham, Denholm, Dewar, Dickinson, Dickson, Dippie, Dodds, Dods, Donaldson, Dougal, Dougall, Douglas, Drummond, Duckworth, Dun, Dunbar, Duncan, Dunlop, Dunn, Dunse, Dykes, Dysart, Edgar, Edge, Edington, Edminson, Edmunds, Elliot, Ewart, Fair, Fairbairn, Fairley, Fairlie, Falconer, Farlie, Feairlie, Fell, Fender, Fife, Fish, Fish, Fisher, Fleming, Ford, Forsyth, Fortune, Foster, Foulis, Fowler, France, Francis, Fraser, French, Frizzel, Fulton, Fyfe, Gallagher, Gardiner, Gardner, Gargett, Geddes, Gibson, Gilchrist, Gillan, Gilles, Gillespie, Gillie, Gillies, Gilroy, Gladstone, Goldie, Goodall, Gordon, Graham, Grant, Gray, Greenfield, Greenlaw, Greig, Greive, Grey, Grierson, Grieve, Griffiths, Grundy, Gunn, Guthrie, Guy, Haig, Hair, Hall, Halliday, Hamilton, Happer, Hardie, Hardwick, Hardy, Harvie, Hastie, Haugh, Hay, Headland, Henderson, Hendry, Henry, Heriot, Herkes, Hermiston, Herriot, Hewit, Higgins, Hill, Hindhaugh, Hindmarch, Hiscock, Hislop, Hogarth, Hogg, Holywell, Home, Home Stirling, Hood, Hope, Horsburgh, Hosick, Houliston, Howden, Howgate, Howie, Howieson, Hoy, Hudson, Huildie, Hume, Humphrey, Hunter, Hutchison, Hutton, Inglas, Ingles, Inglis, Innes, Innes-smith, Jacobsen, James, Jamieson, Jeffery, Jeffrey, Jenkins, Jensen, Johnson, Johnston, Johnstone, Jollie, Jolly, Kay, Kemp, Kerr, King, Kirk, Kirkpatrick, Knox, Laidlaw, Laidlie, Laing, Lamb, Lambert, Lamberton, Lamont, Landell, Landels, Landles, Lark, Larsen, Lauder, Laurie, Law, Lawrie, Leckie, Lee, Leiper, Leitch, Leith, Lendel, Leslie, Liddle, Lidgate, Lillie, Lindores, Lindsay, Livingston, Lockhart, Lockie, Logan, Lorain, Loraine, Lothian, Lowry, Lugton, Luke, Lumisden, Lumsden, Lunam, Lyall, Maben, Mabon, Macbeath, Mcaulay, Maccallum, Mccarthy, Maconachie, Mccandlish, Macdonald, Mcdonald, Macdougal, Mackdwgal, Mcdougal, Mcewen, Mcgall, Mcglashan, Mcgregor, Mcgraith, Mcghie, Mcguire, Mcivor, Mackay, Mckay, Mackenzie, Mckenzie, Mclauchlin, Mclaughlin, Maclaurin, Mclean, Mclellan, Mcleod, Mcmurchie, Mcqueen, Mculay, Macvie, Mack, Mair, Malcolm, Manson, Marshall, Martin, Mason, Mason, Mathewson, Maunder, Mavor, Mearns, Megechen, Mein, Meins, Melros, Melville, Menan, Menzies, Mescer, Michie, Middlemass, Middlemiss, Middleton, Millar, Miller, Millican, Milliken, Mills, Milne, Milne Home, Mitchell, Mitchelson, Moar, Moffat, Moffet, Montgomery, Moody, Moor, Moore, Morrison, Mortensen, Mortimer, Mosley, Mossman, Muir, Munro, Murray, Nairn, Napier, Neilson, Nelson, Nesbet, Nesbit, Nicholson, Nicol, Nicoll, Nisbet, Noble, Oliver, Ord, Orzrel, Ostergaard, Pairman, Paterson, Paton, Patterson, Paxton, Penfold, Petersen, Pettigrew, Polwart, Ponton, Porter, Portir, Pratt, Prentice, Pringle, Purdie, Purvas, Purve_, Purves, Purvis, Pybus, Quarry, Queenan, Radulphus, Rae, Rawdon, Rawnsley, Rayner, Rea, Reddin, Redpath, Reid, Reith, Renton, Riber, Richardson, Rintoul, Robertson, Robson, Rogers, Romanes, Romer, Rose, Rule, Runciman, Russel, Russell, Rutherford, Rymer, Samson, Sanderson, Sandison, Sanson, Schuphaas, Scott, Scougal, Scougall, Service, Sey, Shanks, Shearer, Shearlaw, Sheill, Sheirlaw, Shepherd, Sheriff, Shiel, Shiell, Shiels, Shierlaw, Shirlla_, Shirllaw, Shirreff, Simpson, Sinclair, Skeldon, Skene, Slight, Smart, Smettem, Smith, Somers, Souness, Spark, Sparks, Speedy, Spence, Spiers, Spoues, Spriggs, Spring, Stavers, Steele, Steen, Stevenson, Stewart, Stirling, Stobie, Stodart, Stoddart, Storey, Story, Stradsman, Strauchan, Stuart, Summers, Sutherland, Swan, Swann, Swanston, Sword, Syminton, Tait, Taylor, Tear, Telford, Temple, Tendel, Thompson, Thomson, Thorburn, Towle, Trotter, Troup, Tuck, Tulloch, Turnbull, Turner, Tweddle, Tweedie, Umpherston, Unthank, Vanko, Veitch, Vetch, Vetter, Waddell, Waddle, Wagnert, Wait, Waite, Walker, Wallace, Wanko, Waterer, Waterston, Watson, Watt, Weatherly, Webster, Wedderburn, Weir, Welsh, Welsh, Wemyss, Westgarth, White, Whitecross, Whitehead, Whitelaw, Whitford, Whyte, Wight, Wightman, Wilis, Willis, Willsher, Wilson, Wingfield, Winram, Wood, Wright, Young, Younger. Our thanks go to everyone, members of Borders Family History Society and Friends of Coldingham Priory, who helped with the recording and checking of the inscriptions, for the many contributions of information and photographs and for the assistance in putting the publication together. The publication is available on CD, priced at £10 plus postage can be obtained from us at 52 Overhaugh St, Galashiels, TD1 1DP, Scotland, or via our Contacts page using the contact type Order for Publications.